Nothing says spruce up like the color green. From the preppiest greens to the softer shades of apple, going green never looked so good. And now that we understand it a little more thanks to this post, let's look at some of the hottest home furnishings on the market - all in green, of course! 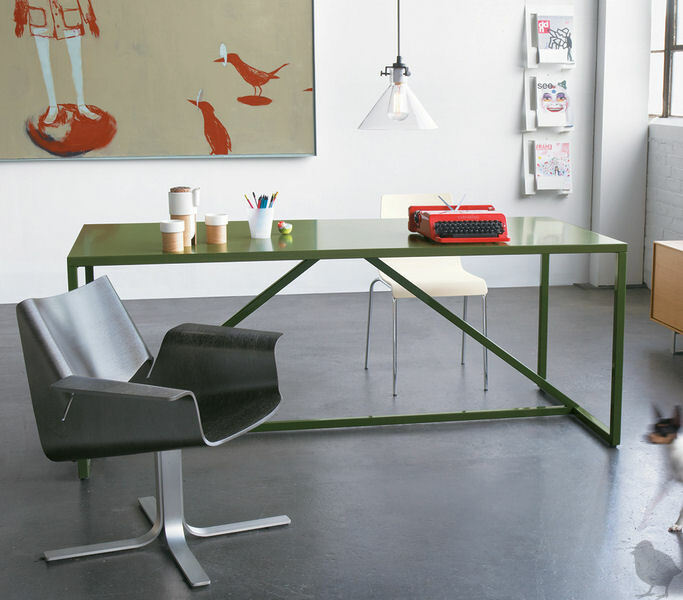 The dark olive strut table from Blu Dot makes my heart skip a beat. I love it in this space, paired with red, hints of robin's egg blue, and brushed nickel. Excellent color combination. Want to go a little crazy? 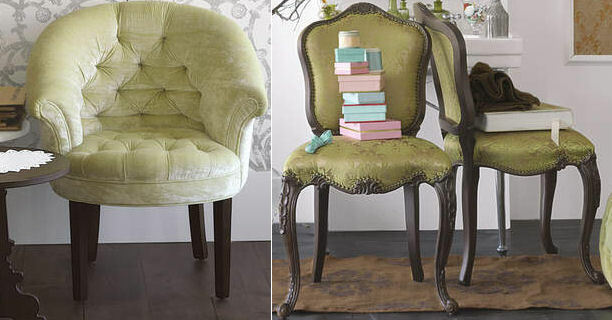 Here's a few fun green patterns from Anthropologie. The ditte sofa in green and white, or in solid leaf. Although this sofa is very expensive, and I'd never purchase it in anything but a solid since I get tired of prints quickly, it is the most comfortable sofa I've ever sat on in my life. My husband even tested it out and loved it. The pepper green corrigan chair is another comfortable charmer in soft tufted leather, or go wild with this josef frank wingback. 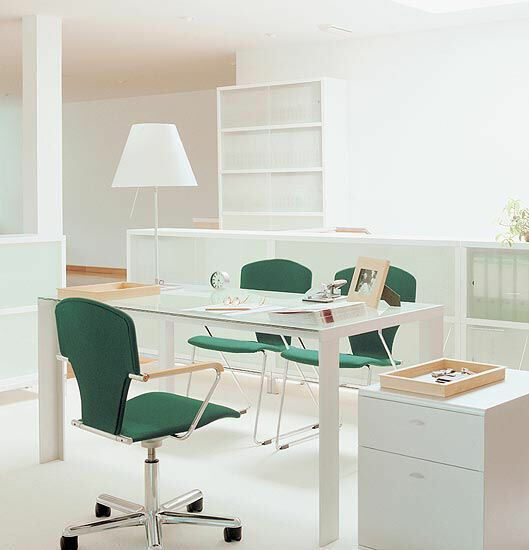 If you prefer a richer green, go with these forest green Egoa task chairs from Josep Mora. Doesn't green look gorgeous with pure white? Of course, who can forget some of the classics. 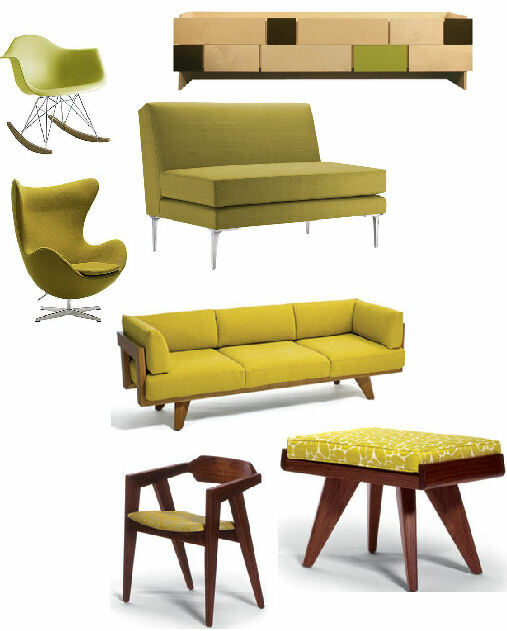 The Eames shell rocker in lime and a wool chartreuse Arne Jacobsen egg chair from DWR are great green finds. Another nice seating option is this olive David Mocarski Libre two-seater sofa because it's comfortable and doesn't take up a lot of space. Notneutral has a new collection of Tetra cabinets with drawers and trays you can add in green (as well as a few other colors), and for all you mid-century lovers out there, the new collection from Sherwood Hamill for Angela Adams is my latest obsession. 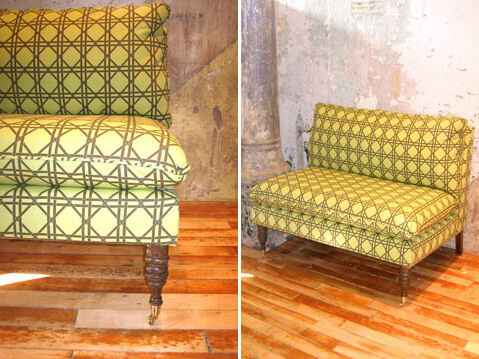 I love it all (amazing finds), but the pieces shown above in yellow-green have my attention. If it's pattern you crave, Urban Outfitters has a ton of new furniture in, one being this great little green pillow top settee in a lattice print. Lattice is huge right now, have you noticed? 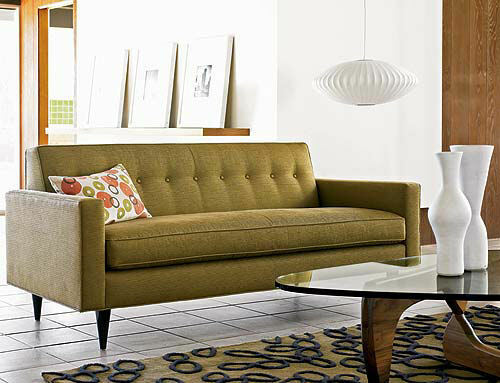 For something a little more girly, try this fainting sofa in juicy green apple. Here are a few picks from Brocade that ooze with femininity and charm. 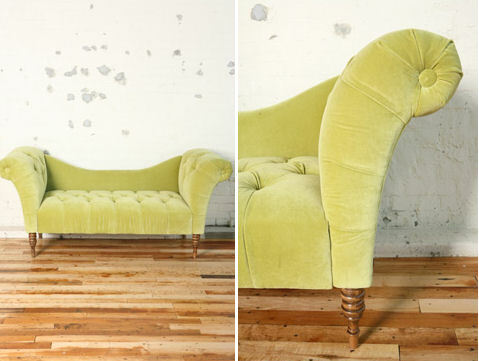 All green and glorius... A tufted bucket chair in pear, or a hand-carved curve back chair in stem. Or perhaps you want to add a moss green silk regency headboard to your bedroom. This would look lovely with crisp white bedding (the chocolate satin bedding urban's shows it with is hid-e-ous, don't click here whatever you do - it's like a 60's one-nighter hotel.) But the headboard works, I love the shape. 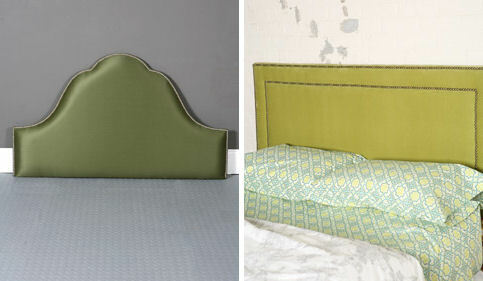 If you prefer cleaner lines, but still want a touch of glam, try their velvet apple green headboard instead. 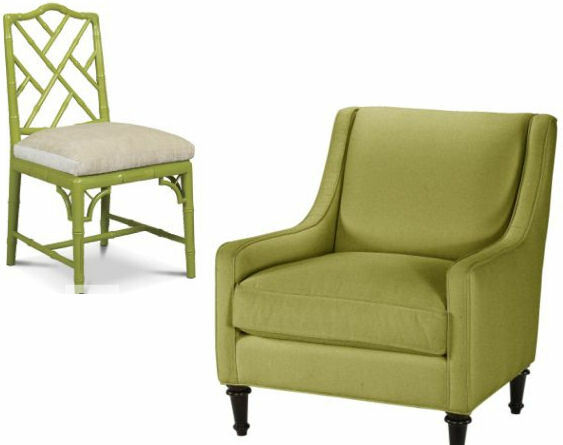 The chippendale chair in lime, from Jonathan Adler is perfection on 4 legs. If you're a Chinese chippendale fan, Tonic Home has a great outdoor bench (not shown) in sage (free shipping! ).Not sure if you shop Ballard Designs, I'm part of their designer's program and I've placed several orders with them for clients. Almost all of their soft furnishings are available in a range of fabrics and patterns, several patterns have green as the dominate color. I really like the lines of this Chatfield chair. 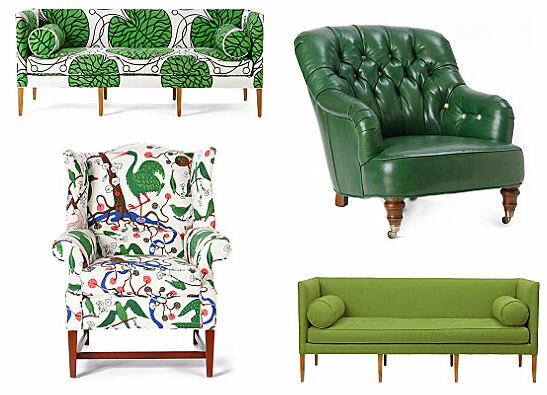 Any green furnishings that you'd like to suggest?